Ich habe bisher 4 verschiedene Etiketten ausprobiert und bin sehr zufrieden damit. Our self-adhesive labels stick to any clean, dry, flat, non-greasy surface at room temperature. Make sure you remove any air bubbles trapped under the label, by pushing them towards the edge of the label! Round corners stick better. After applying the label, we advise you to leave it for a few hours and to avoid any contact with water. The labels are dishwasher* (up to 60°), freezer and microwave safe. At temperatures higher than 60°, for example for sterilising or boiling baby bottles, it could be that the colours fade away sooner and the structure of the labels change. There’s a slight possibility that labels can come off. *In the dishwasher do not put the labeled product too close to other items. Our shoe labels are especially designed to fit inside the shoe at the heel area. A special transparent coating protects the labels from sweat and abrasion and protects it from fading away. Stick the shoe labels on a smooth, flat and dry surface. Then, put the supplied transparent coating on top of it and press it firmly. Since the mini labels are quite small, they are not as dishwasher and microwave safe as the bigger labels. If you use the (mini) self-adhesive labels on items such as mobile phones, MP3 players and stationery their life-period might be shorter, since they are subject to a higher friction when they are in pockets and cases and since you might touch them often with your hands. ● Our "deluxe" labels are not weatherproof and not suitable for the dishwasher, freezer or microwave, by the composition of the gold/silver metal material. ● Press Warranty Void Labels firmly. The ´tamper-evident´ effect occurs only after two hours after applying the labels. These self-adhesive labels stick easily to the existing polyester washing instructions/care label or comparative smooth piece of textile such as lining or rainwear. Ultimate adhesive strength, the strongest of its kind, but removable. Optimum adhesion after 2 hours after application. After about 8 hours washing machine safe (up to 60°C) and dryer resistant. By the use of fabric softener or wool detergent, or adding stain remover to the laundry, the labels may come off. 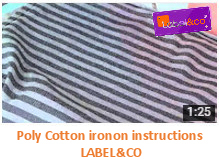 Ironing labels can be used on fabric such as cotton, cotton/polyester and polyester/acrylic; but they are not suitable for fabrics that have a water repellent or dirt resistant coating, (coarsed) knitted fabrics, spandex or (very) movable surfaces because the label cannot hold itself properly. For long-term enjoyment of your ironing labels, follow the instructions below carefully. Pay attention to the ordered type of label (flex material or cotton/polyester). Set the iron to setting 3 (cotton), without any steam. Get a label of the semi-transparent backing and place it, with text up, to the desired location on the fabric. Cover the label with the included protective sheet* and firmly press the heated iron for approximately 10 seconds on a hard, smooth surface. After ironing carefully remove the protective sheet, let the label cool and check if it adheres. In case the label comes off repeat steps 3 and 4. Check the heat of the iron. *For best results, your also place a tea towel on the protective sheet! Put the iron on the hottest setting, without steam. Place a label with the text up to the desired position on the fabric. Place a tea towel on the label and and firmly press the heated iron for approximately 35 seconds on a hard, smooth surface. After ironing carefully remove the tea towel, let the label cool and check if it adheres. If the label release something, repeat steps 3 and 4. Check the heat of the iron. > Cotton/polyester iron-on labels become softer by washing and do not itch. They are almost indestructible, but you can also remove them by reheating the label with a tea towel and hot iron. Then you can take them out again. The durability of our labels also depends on the heat, the pressure of the iron, and its pressure duration. Check the garment care label first! Always wash the garments inside out and never ironing directly on the labels as applied, but on the rear side thereof. Do not thumble dry. Do not dry clean. During the washing from 60°C and by the use of fabric softener or wool detergent, or adding stain remover to the laundry, the labels may come off. Temperature and time may vary by iron and type of fabric! PS: Please be careful with the heated iron and keep (small) children at a distance during this procedure. Also please be aware that labels could be swallowed and cause suffocation. Should you have any questions, you can contact service@labelandco.com. Sewing labels are easy to sew and perfect for (homemade) clothing and other textiles. We offer fabric labels, polyester, nylon / polyamide and satin, which are printed with industrial quality equipment, for best results. Polyester labels are lightweight, have a high abrasion resistance and feel (even after washing) very soft. The label can be a bit static, but it remains in the form and does not discolour in direct sunlight. Nylon (polyamide brand name) is lightweight and easy to fold. Nylon labels are strong, tear, crease and retain their shape. Not without reason the most widely used label type. Satin polyester labels are extra fine woven, in a special way, making them shine and extra soft. These labels have a great printing result, which remains readable even after many washes. Unique to each application and great result! Note: Cut edges may fray slightly. Double stitching or fold ends gives strength for best results, therefore additional space of approximately 8 mm each side to sew. For all types of synthetic fibers are generally the same excellent performance with washing or dry cleaning and durability. Sewing labels will held better when stitched on several points, the label will wrinkle less after washing. Your sewing labels can be ironed. Please do so but watch the thermal state of the iron. We do not recommend adding stain remover to the laundry, because the printing may blur. Please let us know if we can be of further assistance!